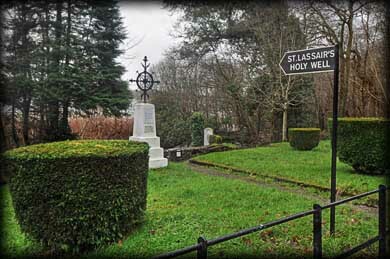 On the opposite side of the road from Kilronan Abbey is the Holy Well associated with St Ronan's daughter St Lasair. 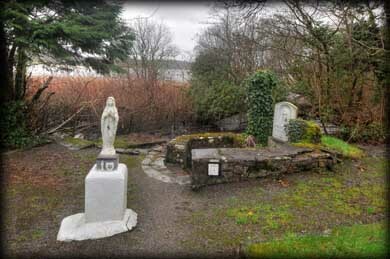 Her grave is said to be marked on the hill above the graveyard, next to the original location of the well. When Cromwell's soldiers desecrated and tried to block off the well, it re-appeared in its present location at the bottom of the hill. There is a pattern here on the Sunday nearest to the 8th September. The well is surrounded by a low wall upon which stands a plaque commemorating the visit of Pope John Paul II in 1979. There are also a number of stations where pilgrims would stand and pray whilst doing their rounds. One of the stations is a large slab mounted on four stone pillars, known as leac Ronain or St Ronan's Altar. This was used as a mass rock and it is believed the pilgrims would come to drink the sparkling water from the holy well and try to ease aching backs by crawling under the altar stone three times. 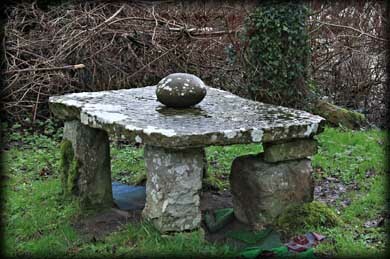 On top of the table is a large stone similar to a cursing stone. Many pilgrims would also gather clay from St Lasair's grave to bring home with them to cure family or friends from certain ailments. Being the winter months the area around the well was quite muddy and the water was very murky on our visit. Hopefully the area will be cleaned up during the summer period. Situated: From the N4 at Ardcarn head north on the R285 to Keadue. Just before Keadue turn left on to the R284. Drive along the side of Lough Meelagh. The Well is sign-posted opposite Kilronan Abbey. Discovery Map 26: G 8980 1219. Last visit Dec 2011.